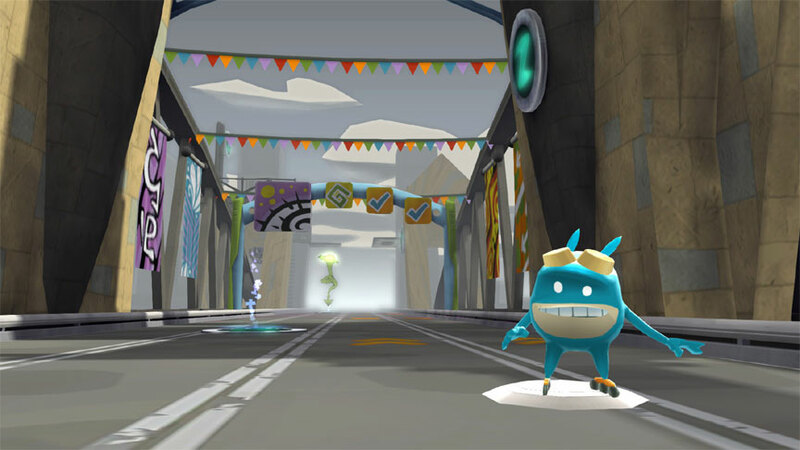 In 2008, a game released on the Wii called De Blob. It was a puzzle/platformer that put players in the role of Blob, a resistance fighter against the evil INKT Corporation, tasking him with painting the town red… and blue… and yellow. Really, his whole shtick was just painting towns, and rumor has it he put every single painter in Chroma City out of work- worse yet, Blob is an immigrant, so De Blob is really just social commentary about socio-economic instability in the labor market. It’s actually not, but there’s only so much that can be said about the plot of a decade-old game. 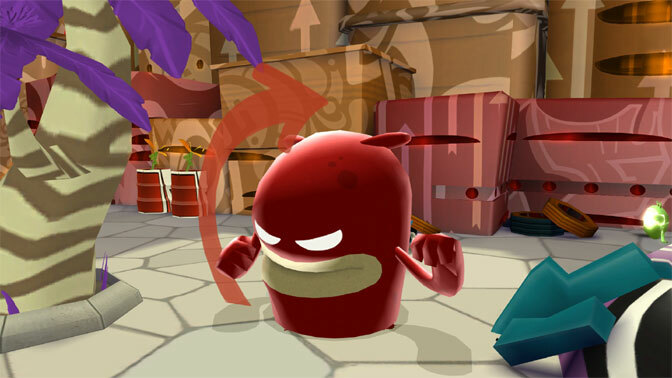 So does De Blob go hard in the pain, or should you not let this game strip away your hard-earned cash? Let’s find out. 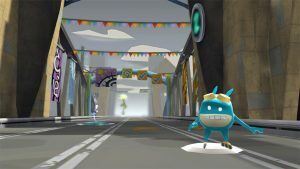 The moment you select a stage in De Blob, you’re thrown into a world largely devoid of color despite being surprisingly cartoony and charming. Color-vacuuming robots wander the streets, and people are apparently afraid to leave their homes due to the occupying enemy forces. So, naturally, it’s up to Blob to shatter the paint robots, get paint all over himself, and then color all of the buildings and foliage by rubbing himself all over them. 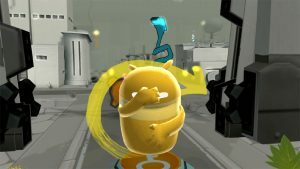 Honestly, the gameplay of De Blob wouldn’t work at all if your character was a normally-proportioned human male, covering himself in paint and then rubbing himself against people’s houses, but now that such a thought is in your head, let’s continue covering the gameplay. You soak up colors by destroying paint-holding robots and then free the Raydian inhabitants of Chroma City by coloring billboards, buildings, and more- then those city natives reward you with bonuses. 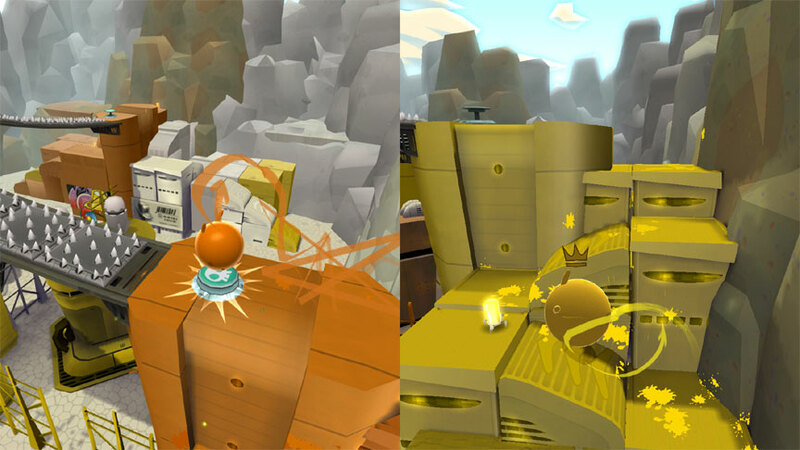 There are numerous hazards to avoid, such as water, which washes away whatever colors Blob has, and black ink (in the game’s vernacular, ink is bad, but paint is good) that hurts Blob and causes you to remove color from any painted space until you wash yourself clean in water (which means it removes your color and lowers your paint gauge too). You have a paint gauge that fills up from 0 to 100 the more paint bots you destroy, and sometimes you’ll find yourself with a door that needs 90 purple paint to open, but there’s a sea of ink and water in between so you have to make careful jumps or risk having to backtrack to find red and blue paint bots again in order to reacquire your paint color and refill your gauge. Not to mention, all of this is done under a pretty relaxed time limit, though the game gives you tons of opportunities to extend your timer throughout any given stage. Later stages will have substantially more difficult traps and enemies, too, such as robots that fire ink at you in really inopportune locations (some conveniently where the camera will get stuck or freak out, but more on the camera later). 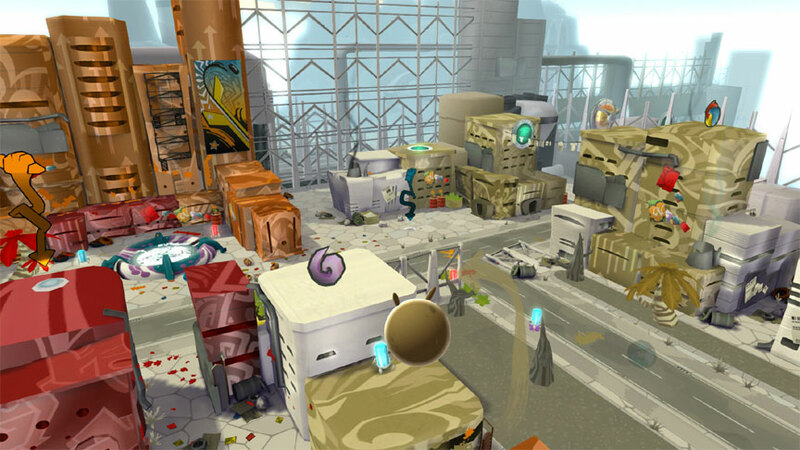 Each of De Blob’s ten levels is broken up into multiple sections, and in order to proceed from section to another, you have to achieve a minimum paint score. Freeing the city’s inhabitants in each of these areas can reward you with additional time bonuses to allow you to more easily explore the entirety of a level. 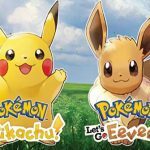 There are also challenges littered about the map which require you paint buildings certain colors, reach a specific spot of the map, or undertake any number of tasks in a short time limit of 30~ seconds or so. These are just quick, rapid-fire tasks you may elect to complete as you progress through a stage, and if you complete them on your first attempt they give you a much larger bonus to your score or better rewards, such as more time. 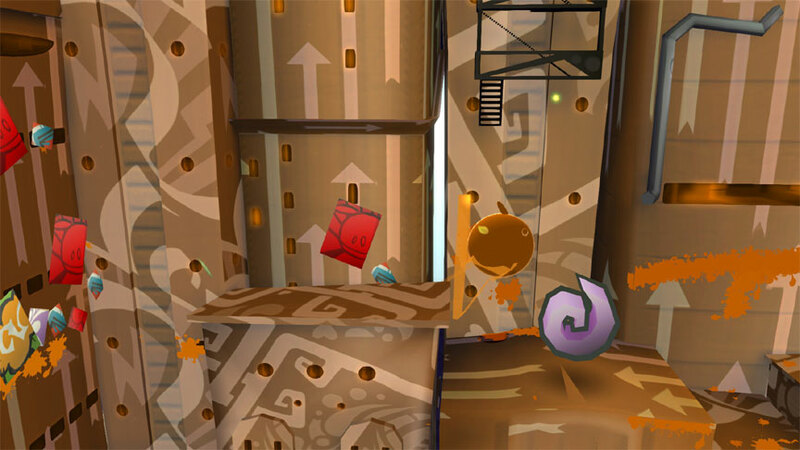 There are also various collectibles to find in each stage, such as styles which can change the pattern Blob paints on buildings, not to mention each level has various achievements for completing specific tasks, like painting every surface within a level, freeing all Raydians, locating all collectibles, and so forth. Upon completing stages, players will unlock additional events that tend to be more challenging, but usually shorter, than the main play of the level. The additional events usually have more difficult objectives or constrained time limits- a welcome change of pace from the leisurely stroll players can make through the full levels (as while there are time limits in the main levels, it’s so absurdly easy to accrue extra time in most of them that the remainging time is just a score multiplier). 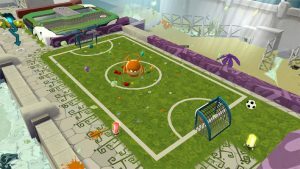 There’s also some additional modes- up to 4 local players can partake in a mode called Blob Party, which has eight different sets of multiplayer games for players to enjoy. For example, Paint Match plays a lot like an early concept of Splatoon, where each player tries to paint as much of a town as they can, having you attack and nudge your opponents out of the way to victory, Turf Wars style. Blob Race is similar, but you are given a specific area to paint and areas that have already been painted can’t be colored over. Meaning: If your opponent finishes coloring his buildings first, he can roll his way over to your side and begin marking on your stuff like a toddler someone took their eyes off of for two seconds, and the largest score at the end wins. De Blob may not hold up against the best multiplayer offerings out there, but it can function as a cute party game every so often once you beat the main story, at least. Paint the town with a copy of De Blob from Amazon! There’s even a free paint mode where you can just roam around and explore already-completed levels, which can be handy if you’re trying to locate specific collectibles or want to increase your overall score in a particular stage. It’s a lot more of the same, but thankfully De Blob looks great on the Switch’s screen, whether in docked or portable mode. 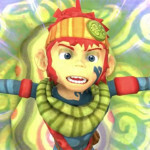 The visuals are crisp and clean, and the humor and art style have help up over the last decade which make the game easy to connect with, even for picky gamers. The sound effects are quite catchy, as you can change the rhythmic beats to different musical styles, so coloring buildings can take on a jazzy sound or a variety of others you can unlock. 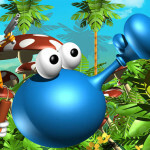 The controls have completely done away with the Wii’s original waggle controls- back in 2008, players had to shake the Wii remote in order to jump, while in this version it is a simple press of a button. Unfortunately, most of De Blob’s issues weren’t solved by just changing the mechanism for jumping: Awkwardly floaty physics and significant camera problems still persist throughout the adventure. 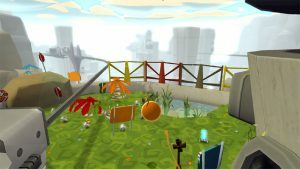 De Blob is a game about painting buildings specific colors, but the camera can get hung up on just about every structure in the game, which makes controlling the Blob more difficult than it needs to be during areas with complex level geometry. It’s not something that you can’t just work around or deal with, for the most part, but odds are the camera randomly shifting mid-jump because it got stuck on something will cause you to miss a jump at least once per level. The above control issues also coincide with the fact that the game gets extremely repetitive, especially later on in the game. It’s a great game, especially for a port of a 10-year-old game, but because this is a port and not a remaster, De Blob kind of suffers from the repetitive game-lengthening decisions that plagued titles in and around 2008. 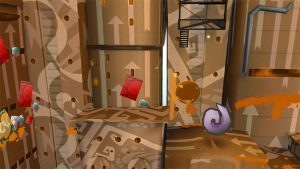 Jumping with a button instead of a shake of the Wii remote feels great, but the game as a whole is a slow, kind of methodical parkour that shows its age in its mechanics. It’s still a very solid package that can keep a player busy for 20 hours or so if you aim to fully complete it (a full playthrough should only take about 8-10 hours though), and has some multiplayer modes thrown in that actually isn’t terrible for a time where basically every game had tacked-on multiplayer. 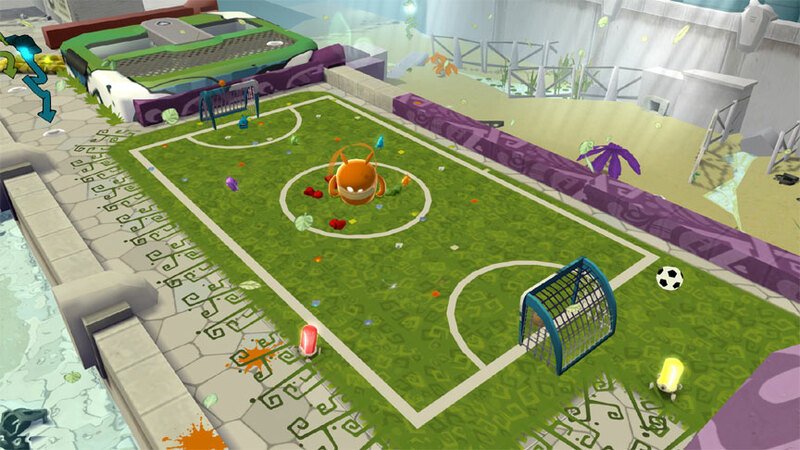 Overall, De Blob isn’t a bad game, just an old one that could have used some spit-polish. 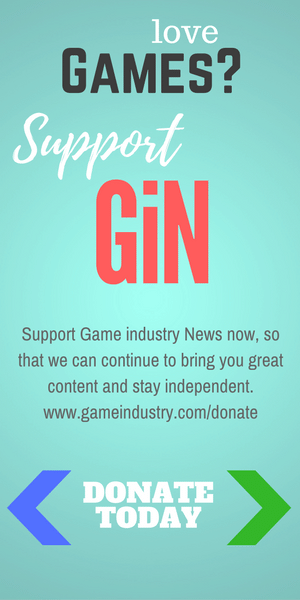 The camera issues make the repetitive objectives toward the later quarter of the game can make it a somewhat cumbersome experience, but that’s a player by player kind of thing. 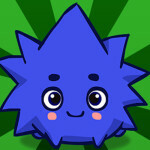 If you enjoy 3D puzzle/platformers and never got to experience De Blob back when it released, now is a great time if you’re really looking for something cute and colorful to play. There are better 3D platformers on the Switch right now, however, such as the Crash Bandicoot Trilogy and Mario Odyssey, but it would be insane to compare a budget title like De Blob to one of those games. De Blob could, however, be a viable choice next to Yooka-Laylee or Snake Pass, so if you liked one of those, De Blob is an easy recommendation. Previous PostMovie Monday: Men in BlackNext PostVideo Game Tuesday: What’s Going On With F/GO?